This week has flown by. After being credit card scammed, the hustle and bustle of summer camp and my natural hair drama, I am so ready for the weekend. I am really excited that my patio furniture is on the way. The tracking says tomorrow, but it looks like Saturday. I pray it looks the way I pictured it. I discovered these Smirnoff frozen drink pouches in Publix the other day. They were 4 for $7. 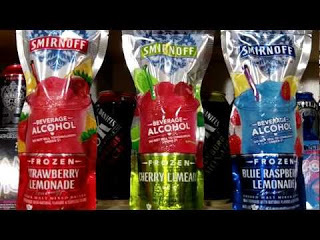 You just pop them in the freezer for 6 hours or so and then run warm water on the pouch for like 20 seconds and bam you have a frozen daiquiri. They come in a variety of flavors. So far I am loving the strawberry lemonade.I can’t wait to sip them on our new patio set. What is your favorite summer drink?